What Are Error Coins? How Much Are Coin Mistakes Worth? Have you ever heard about error coins? Simply put, an error coin is a mint-made mistake — in the process of creating the coin at the U.S. mint, some sort of mistake was made affecting the “look” of the coin itself. There are many types of error coins, and the exciting thing about error coins is that they can often be be found in circulation. Here’s the kicker: error coins are often worth hundreds and even thousands of dollars! Error coins as a category are usually divided by the type of error, of which there are several. Bear in mind, this list is by no means exhaustive. There are dozens of recognized errors; the 6 mentioned here are major error types and are presented to help introduce you to the larger realm of error coin collecting. Doubled-dies may be one of the most popular types of coin errors. A doubled-die refers to the doubling of all or part of the image on a coin. Typically, the doubling is confined to one side of a coin, and it is normally best seen in the lettering of a coin. However, parts of the design image can also show doubling effects, if the doubling is prominent enough. Perhaps one of the most famous coin errors of all time is the 1955 doubled-die Lincoln penny. Worth almost $1,000 in well-worn condition, the 1955 doubled-die penny has been drawing mainstream attention for over 50 years. Blank planchets are not hard to spot, if you are lucky enough to locate one. (By the way, a “planchet” is simply the round piece of metal a coin is made from.) The result is a blank piece of metal that is the same size, shape, and color as a typical coin. Some are worth only a few dollars, but many are valued $10 to $20 and up. Broadstrikes are fairly valuable. When coins are struck at the U.S. Mint, they usually are momentarily placed inside a collar during the striking process to help create a properly formed rim. When the coin is not inserted inside the collar, the coin will tend to spread out a bit upon being struck. The result is a coin with an odd-looking rim (if there even is any), and the design may be off-center. The coin will also often be wider than it is supposed to be. This type of error is called a broadstrike. Depending on the type of coin, relative over-width of the coin, and the centering of the design, broadstrikes are worth anywhere from $5 to over $200. Coins struck with the wrong metal or wrong design are always in demand. One of the most famous examples of coins struck on the wrong metal are the few 1943 pennies that were struck on bronze planchets instead of the steel rounds intended for 1943 cents. Lincoln penny designs on dime planchets, Washington quarter designs on nickel planchets, and so forth are common examples of “wrong design” errors. Some of these errors are worth thousands of dollars. Off-center coins are often quite eye-catching. 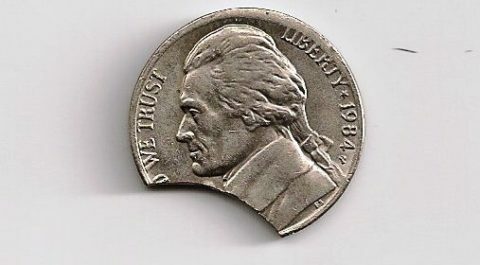 Some off-center errors are off by more than 50%, meaning only half the design has been struck on the coin, the other half of the coin is typically blank. With off-center coins, the values usually escalate as more and more of the design is missing, and prices do vary widely, depending on the type of coin. Many are worth $50 and up, and several are worth well into the hundreds of dollars. Clipped planchets are the final type of error coin we’ll discuss here. The device which cuts the planchets out of the huge strips of metal that first enter the mint sometimes cuts a planchet more than once. When this happens, it can cut away a portion of the planchet, resulting in various-sized crescents. Most clipped coins are worth between $5 and $100, depending on the type of coin, grade, amount of missing metal, etc.